A century ago, Einstein revolutionized our understanding of the universe with his new theory of gravity and space-time. 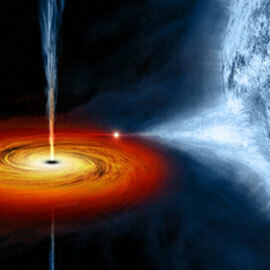 Since then, ideas like the Big Bang, dark energy and the existence of black holes have been revealed. In his talk, McGrath will explore the puzzle pieces that Einstein put together to discover this new theory and explain how it changed our picture of the universe to come to our present-day understanding. But the journey will not stop there. McGrath is an assistant professor in the Department of Physics and Computer Science at Laurier and an adjunct professor in the Department of Physics and Astronomy at the University of Waterloo. He earned his PhD in gravitational physics at the University of Waterloo and his master’s in particle physics at the University of Alberta. “The Secrets of Gravity” will be held in room N1046 in the Science building on Laurier’s Waterloo campus. The lecture is part of the Physics and Computer Science Seminar Series, coordinated by McGrath, Ilias Kotsireas and Marek Wartak.